As soon as I saw this recipe over at Closet Cooking, I was excited to make it. Roasted red peppers and feta work so well together, and I’m a big fan of any fritter-like food. As we were eating, Zak told me he was initially skeptical about the sounds of this meal but was very pleasantly surprised at first bite. I wasn’t quite sure what to expect, either, but we were both very happy with the final result. I decided to punch it up just a bit by adding some corn to the fritters and creating a spicy balsamic reduction. The spicy balsamic paired very nicely with the sweetness of the roasted peppers and saltiness of the crumbled feta cheese. These fritters are absolutely gorgeous. They would serve 4-5 as an appetizer and served the two of us as a light meal. 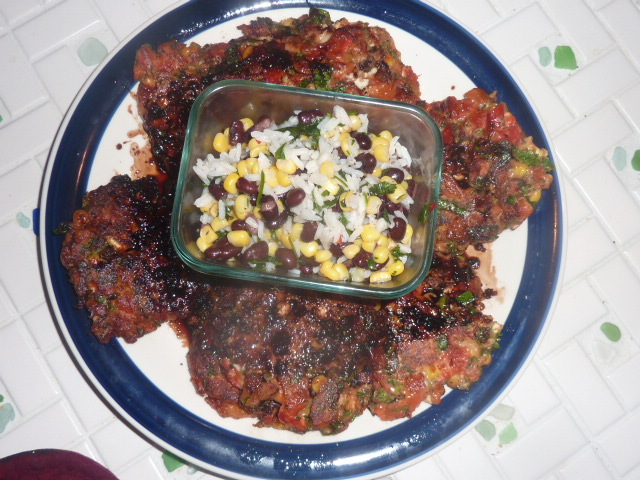 I added a small black bean and corn salad as a side dish to round this out as a full meal. Paired with the sweet corn and creamy black beans, this was a real winner. In a medium bowl, mix together chopped roasted red peppers, corn, parsley, oregano, onions, garlic, feta, balsamic vinegar, kosher salt and freshly cracked black pepper. Mix together thoroughly. Heat oil in a 10″ cast iron skillet over medium high heat. Spoon about 1/4 cup of fritter mixture, flattened, into the pan and cook 3-5 minutes per side until crispy. Serve with spicy balsamic reduction. Heat balsamic vinegar and garlic clove in a small saucepan over medium heat. When bubbles begin to form, whisk in brown sugar and sriracha. Let simmer until reduced by half and thickened slightly, about 15 minutes. Let cool to room temperature. Remove garlic clove before serving. Serve atop roasted red pepper and feta fritters. Mix together all ingredients and let chill in refrigerator.